Balloon Time gives you a convenient alternative to transporting pre-inflated balloons. The Balloon Time Helium Tank is lightweight, disposable, easy to use and recyclable. The Foil Balloon Helium Kit is available at Costco UK stores and contains a portable cylinder with 0,25 m3, and everything you need to make bouquets of Mylar/foil balloons. Complete with 50 colorful balloons, this kit contains everything you need for an instant celebration. With 0,42 m3 of helium, the portable, recyclable cylinder will fill up to 50, 22.8 cm (9”) latex balloons; 27, 27.9 cm (11”) latex balloons; or 27, 45.7 cm (18”) foil/Mylar balloons. This portable cylinder, with 0,25 m3 of helium, is perfect for mixing and matching balloons to customize your celebration. The easy-to-use tank is recyclable and fills up to 30, 22.8 cm (9”) latex balloons; 16, 27.9 cm (11”) latex balloons; or 16, 45.7 cm (18”) foil/Mylar balloons. Complete with 30 colorful balloons, this kit contains everything you need to make fun, floating party balloons. With 0,25 m3 of helium, the portable, recyclable cylinder will fill up to 30, 22.8 cm (9”) latex balloons; 16, 27.9 cm (11”) latex balloons; or 16, 45.7 cm (18”) foil/Mylar balloons. This portable cylinder with 0,42 m3 of helium is perfect for celebrations at home or on-the-go. The easy-to-use tank is recyclable and fills up to 50, 22.8 cm (9”) latex balloons; 27, 27.9 cm (11”) latex balloons; or 27, 45.7 cm (18”) foil/Mylar balloons. These products are proudly made in our Portugal facility. 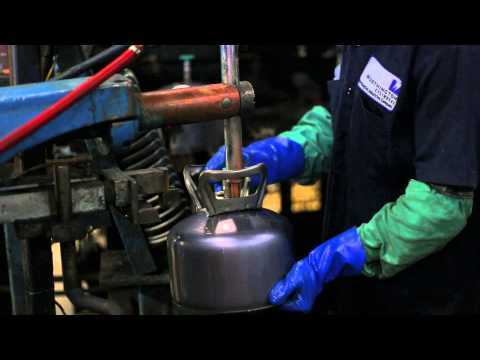 Take a look at how Balloon Time Helium Tanks are manufactured in Worthington Industries' Columbus, Ohio facility. From everyday moments to milestone events, Balloon Time has been a part of uplifting celebrations for more than 30 years. This product can expose you to chemicals including DINP, which is known to the State of California to cause cancer. For more information go to www.P65Warnings.ca.gov.